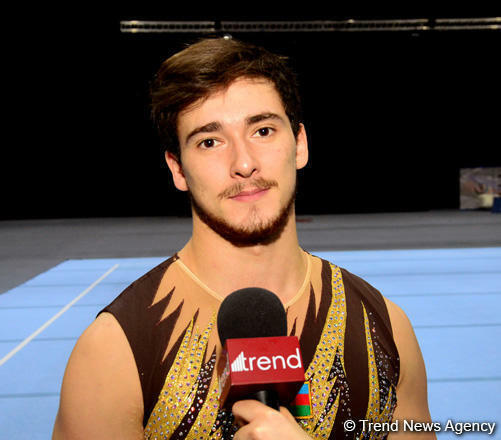 The athlete stressed that responsibility is increasing because the FIG Acrobatic Gymnastics World Cup will be held in Azerbaijan for the first time. “It is a great pride when you become a winner in your home country and the flag of your country flies, and, of course, this makes you more responsible,” he said. The FIG Acrobatic Gymnastics World Cup will be held for the first time in Baku on November 17-18. Teams of Belarus, Israel, Kazakhstan, India, Russia and Ukraine will participate in the competitions. At this World Cup, Azerbaijan will be represented by bronze medalists of the recent European Championships, Mixed Pairs - Abdulla Al-Mashaykhi - Ruhidil Gurbanli and Aghasif Rahimov - Nurjan Jabbarli. Silver medalists of the World Age Group Competitions (2016) - Seymur Jafarov and Murad Akbarov - will compete for the best places within the Men's Pairs competitions. During the two-day event, gymnasts born in 2003 and older will compete in Men’s Pairs, Women’s Pairs, Mixed Pairs, Women's Groups and Men's Groups competitions. The traditional AGF Trophy Cup will also be presented to Pairs and Groups who get the highest scores at the event.